Former Prime Minister Hwang Kyo-ahn on Tuesday officially joined the race for leadership of the main opposition Liberty Korea Party, sparking controversy over his eligibility and ties to the Park Geun-hye administration. Hwang’s bid faces strong opposition in the political arena due to the prominent role he played during the Park administration, such as his posts as prime minister and acting president. With competition for the party’s leadership heating up, some members of the main opposition party, including the party’s emergency committee Chairman Kim Byung-joon, have expressed concern and disapproval of Hwang’s candidacy, as the party struggles to break away from its links to former President Park. “The Moon Jae-in government’s tyranny is the root cause of all agony and instability. Activist political theories that should been buried are controlling South Korea’s government affairs in the 21st century,” Hwang said, declaring his candidacy at the Liberty Korea Party’s office in Yeouido, western Seoul. “The left wing’s outdated income-led growth policy has become the administration’s dogma. Entrepreneurs and small businesses were the first to be hit. Young people are unable to find jobs. I will save the country that is on the verge of going back to the past,” Hwang added. 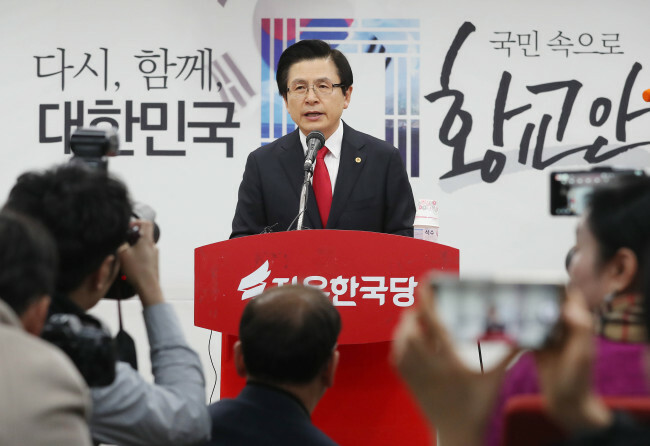 The party’s election commission has discussed Hwang’s eligibility, as the party’s regulations stipulate members have to pay three months of membership fees in order to run in a race. Hwang joined the party earlier this month. The election commission unanimously approved of Hwang’s bid, but it is unclear whether it will pass the emergency committee’s vote slated for Wednesday. Torn between breaking away from its association with former President Park and cautious not to lose supporters on the far right, the Liberty Korea Party has been in search of a new leader. Widely perceived as a pro-Park figure, Hwang faces questions about his involvement in the disbandment of the now-defunct Unified Progressive Party during his tenure as justice minister and his alleged ties with Choi Soon-sil, a confidante of the ousted Park at the center of the political fiasco. Raising the possibility that Hwang had known Choi before the scandal surfaced, local newspaper Hankyoreh reported a transcript of a conversation between then-Saenuri Party member Park and Choi mentioning Hwang’s full name before the night of the party’s national convention in August 2012. Members of the now-defunct Unified Progressive Party sued Hwang for abuse of power as justice minister, claiming he hampered plaintiffs from having a fair trial and kept the Constitutional Court from independently and justly handling the disbandment case. For the first time in Korea’s constitutional history, the Constitutional Court disbanded a political party in December 2014. Amid controversy surrounding Hwang, his bid attracted support from base supporters, and he ranked No. 1 in a survey as the most preferred next presidential candidate. Garnering 17.1 percent of support among 2,515 adults surveyed, Hwang took the lead for the first time since the survey began in August last year. Trailing him were Prime Minister Lee Nak-yon with 15.3 percent and Gyeonggi Province Gov. Lee Jae-myung with 7.8 percent, according to local pollster Realmeter. This is also the first time Hwang has taken the top spot within the 2 percentage point margin of error and the first time Lee Nak-yon has slid to second place. “Core supporters of the Liberty Korea Party and conservatives in their 30s and over 60 years old residing in Daegu, North Gyeongsang Province and (the North and South) Chungcheong provinces rallied around Hwang,” said local pollster Realmeter. Hwang’s rival for party leadership, former Seoul Mayor Oh Sae-hoon, came in as the ninth most preferred, falling from No. 4 in the previous survey conducted in December last year. Meanwhile, former Liberty Korea Party leader Hong Joon-pyo bashed Hwang’s bid for party leadership, claiming it would revert to the “impeachment party, pro-Park party and privileged party,” as he hinted he could join the race.